‪When the Water for South Sudan team scouts a site for a new borehole, they read the land; they don't use any equipment or technology. ‪"But you have never missed a well?" I asked. Salva and Lion both laughed at me. ‪"No because you can always tell where there is water if you are paying attention." “It is strong but it will still bend,” I heard someone say. I watched out the back window as the tree popped back up behind us. I wondered how Adinani learned which ones will bend and which ones won’t. When the path thinned to foot size, we parked the Land Cruiser and walked. Soon we came to a clearing where five large tukols built for cattle stood in the center. The well was about 20 yards beyond the clearing. It was a sleepy village. There were only three people at the pump. At 10:00 am it should have been busy with women and children lining up for water, jerry cans overflowing at the pump's base. I asked Lion where all the people were. He said it was a cattle camp. The children as young as nine years old take care of the cattle during the rainy season, but during the dry season, they go back to their homes. ‪Later, I asked Lion who takes care of the children while they are at cattle camp. He laughed and said, "No one. They take care of themselves." ‪"But who teaches them how to tend to the cattle?" ‪"They don't need teachers. They just know. That is how they grow up." ‪"But, do they cook their own food?" ‪"They stay by themselves in the camp and they drink the milk of the cows. They don't cook. Sometimes the villagers will give them food, but mostly, they drink milk." ‪"Yes, yes, yes." Lion laughed at me. I had ridiculously imagined the South Sudan version of an American summer camp. But this wasn’t camp in any way that I understood. It was a necessary part of life where children, like adults work all day in the hot sun. “And if the ground is cracked, that is a bad sign. It is not a good place to drill. That is also where you will find the acacia trees. They are a sign of desert not water,” Salva explained as we sipped on our post-lunch tea. “How can that be? I’ve been all over this country for the last three weeks and acacia trees are everywhere.” I said. The land is different on the side of the compound where we walk every morning toward the rising sun to the bush. There are many acacia there. One evening, we took a walk with Salva in that direction and we came upon a man sitting on the ground pounding away at two pieces of metal. There was no hut nearby or even a mat to sit on, but it looked like he had set up camp. The area had been cleared in a small circle around him. A few feet away from him stood the beginnings of a basic shelter-- a stick and branch skeleton that would soon be covered with a palm roof. He told us that he and his family had fled from the fighting in the disputed territory of Abyei and he was trying to resettle on that little plot of land in Wau. He said he had six children, but one died, leaving him with two girls and three boys. His wife had died recently too. He had burned a few trees to make charcoal for sale at the market. One chicken pecked at the grass around us, and another was hidden underneath a small mesh keeping five eggs warm. Everything in the world he owned was within arm’s length of where he sat and all he wanted to do was finish making his pot so he could cook something for dinner. We thanked him for talking to us and left him to his pot. “And you can tell by the termite mounds too.” Salva continued. “If they are in a line, then underneath is a river aquifer. But if they are scattered around, then underneath is a pool aquifer. These are the signs of life that show where there is water.” I wondered, what in the termites’ little genes made them know water was underneath them? Then I marveled at the survival mechanisms built within us. “Yes, that makes me happy too.” I told her. But, later I thought about it. Food doesn’t make me happy. Subsistence and survival are not things I consider in my normal life. I think about my house with more bedrooms than I need. I think about picking black berries in the back yard to make cobbler for a nine-year old who still knows innocence. What makes me happy is cuddling up on my couch to watch a movie on my big screen and spending time with the people I love, going to dinner with my friends, having the space and time to write, seeing the world. But in a place like this, all of those things seem pretty ridiculous. This morning I went out behind the compound for my morning walk before breakfast, earlier than usual. There were so many people out, that I had to walk deeper into the bush than I had ever gone before. When I was finished, I had somehow gotten myself turned around. There was nothing to orient me. None of the trees looked familiar and the path was gone. I could no longer see the blue roof of the compound in the distance. That set off a chain reaction of irrationality. I imagined myself being hopelessly lost and everyone at the compound searching for me, calling my name, the neighbors’ voices calling out an accented Angelllllleeek, the children screaming kawaaaaaaaja. I felt my throat tighten. I am stronger than that. I swallowed. I walked one way for 50 feet. I turned around and walked another way. Then I turned around again. And again. Then my mouth dried up. I fantasized about my death, dying in the bush, dehydration, heatstroke, the vultures waiting for my chest to stop moving. My heart drummed in my throat. I wanted to curl up in a ball at the base of a tree that did not look familiar to me and heave sobs. I am stronger than that. I thought about those children taking care of themselves and the man on the ground with his pot and his chickens; and I stopped in my tracks. I sat down to breathe in cool morning air and to slow my heart. I thought about the woman tilling her own land for okra. I looked up to the sky. After a few minutes I stood up, turned my back to the rising sun and walked until I found a path. Then I walked some more until I saw the familiar cracks in the ground, acacias by my side, and finally the blue roof of the compound in the distance. When I got closer, I realized I was on a new path altogether. We have evaluated ten wells so far. Today that number will change to 13. What we have learned is that our wells are still operational, but more importantly when a part needs replacing or the well breaks down for some reason, the villages have learned how to be self-sustainable. In villages where wells have broken down, even if the person trained for maintenance doesn't know how to fix the well, they know who they can get for experienced help. And when it's time to pay for the labor and parts, all the members of the village chip in to pay for it. Another thing we have learned is that there are no power issues with any of the wells. Most of the respondents I spoke with laugh when I ask the question about equal access to the well. One man said, "When there is so little water, you cannot deny it to people for any reason. That is not the way we live." Finally, the one thing that remains consistent is that there is not enough. In one village, the chief told me that his area is very large, almost 2,000 people and even though they have one well, it is not enough. They need another well for the villages on the other side, and they need water to feed their animals. There is a well close to the compound, that we pass on the way to the market. The line of Jerry cans waiting to be filled is always very long. At another well near a school, a man named Angelo, who was the headmaster, said the well is too busy during the day with so many people from the village. Everywhere we go, people plead with me for more water. "We are trying," I tell them, and they thank me. Most people tell me that having a well nearby makes them safer. Taking long walks for water leaves their women and children and animals susceptible to wild animal attacks. We are doing some good. These are hopeful results from our short time in the field. My body is not mine here in South Sudan. Everything about this land tries to get under my skin. When I go to the bush, thorns as big as my fingers reach out from trees to scratch my arms. Dried grass like daggers push up from the ground so hard that it pierces through soft soles. There’s no escaping it. When I leave the cover of brush and thorns, the sun burns my light skin; and each day I am here in February, it will only get hotter. In the evening, when it’s finally cool and we’re sitting out under the stars, ants seek out fresh skin to bite. Mosquitoes plump with malaria inject their poisons. Hyenas laugh out in the distance. My body is not made for this land so I have to arm myself with malaria prescriptions, and sun block, and hard soled boots. Yet I am here. Lion and I decided to spend my first week here with the drilling crew before we go off on our own to evaluate wells drilled over the last ten years. This gave me the opportunity to watch the drilling of Water for South Sudan’s 10th and 11th wells this year. When I first arrived in the camp, I was greeted by the local leader, a man named Kiir, who sits in the state’s parliament. He presented me with a goat as a sign of his appreciation. Then he apologized for its size, but promised there would be another before we left. I shook his hand and said thank you in Dinka, Inchalac. 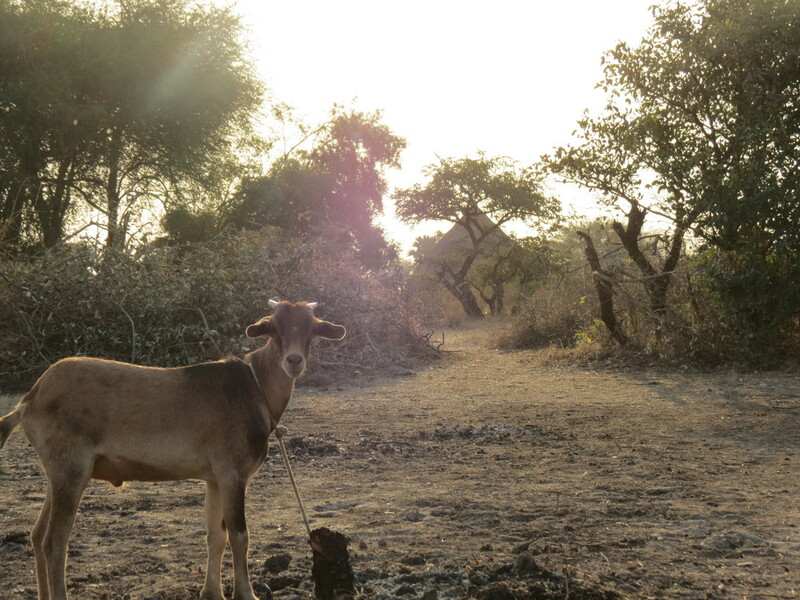 The next morning I watched two members of our crew, Hakim and Malik, knife in hand, walk the goat behind the trees. Hakim held the goat down on the ground to expose his neck, as Malik got prepared. I forced myself to watch through the trees. The goat’s cries were eerily like a child’s, and I felt this sound, like a hand, forcing its way into my throat and squeezing my heart. I expected the slaughter to be quick, but it wasn’t. The goat screamed louder until I heard the knife cut through his esophagus when the screams turned to gurgles. The goat was choking on its own blood. I looked through the trees and saw bright red on brown as Malik sawed at its neck. I squeezed my hands into fists and willed the lump in my throat back down into the center. One morning, Lion and AJ, the crew leaders, went out to scout the site for the next well. I was left in the camp with the women, Agum and Achol, the two cooks: Adau, the crew’s medical staff, and Ajak, one of the hygiene trainers. None of the women could speak much English so I spent my time taking pictures and watching Achol and Adau give each other injections for malaria. Achol had gotten sick with malaria and typhoid before I arrived. 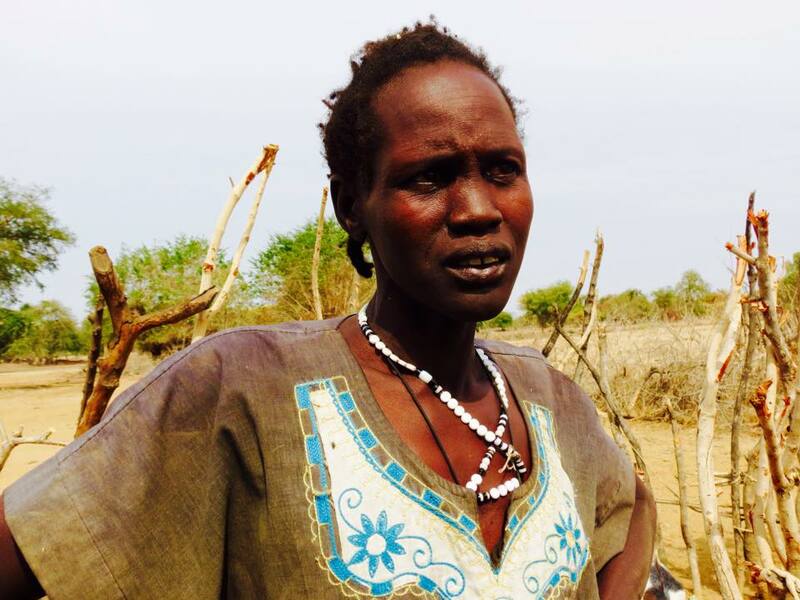 AJ had taken her to the small clinic in the village of Luanyaker nearby. The doctor there gave her fluids and inserted a needle into her vein held by tape. There it would stay for seven days so that she could take the injectable malaria medicine back with her to the field. Then Adau passed out the night before. We checked her pulse and tried to wake her but no response, so AJ and Matthew carried her to the Land Cruiser and brought her to the same doctor in Luanyaker. Now both girls had the needles stuck in their veins held by tape. The injection is supposed to be given slowly to minimize the pain, but Achol still cried as Adau pushed the medicine through her veins. So we began to talk to pass the time. hygiene team members matthew, ajak, achol and adau. “Inyar apay, Angelique. Means I luff you vedy much Angelique,” her English heavily accented. I respond, “Anchipol miet apay,” I am very happy, then we all break out in laughter and they shake their heads yes, because I am learning. On my final day in the camp with the crew, we went to the next village over, Aker Abuok, to get the final pictures of well number 11 and talk to the villagers. After the little ceremony we had with the well, one young girl told Matthew, who had been translating for me, that she wanted to speak to me in secret. I went with her behind the drilling rig. She had spent two days in our camp taking the hygiene training from Matthew and his hygiene team. She was chosen by her village because she was responsible enough to teach others what she learned in the class. She said, “I have no brothers in my house, but I want to go to school to become educated like you and I can’t because my family cannot afford it. Please, can you tell your people I need help.” I asked her how much it costs, she told me 500 South Sudanese pounds each semester, which is about $100 US dollars. I swallowed hard and squeezed my fists tight. Then I put one hand on her shoulder and told her I would. As I walked away, I tried to ignore the villagers staring at me, asking me, emboul. I have not learned the word yet for “sad”. 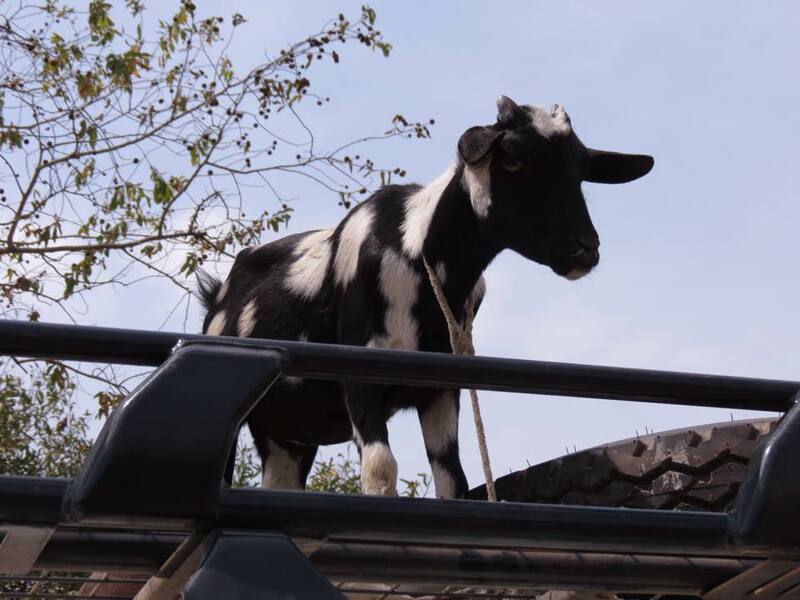 Before we leave the village, Adinani, our driver ties the second goat from Kiir on top of our Land Cruiser. I ask Lion why the goat is there. “Alive? On top of the roof? How does it travel on those bumpy roads?” I asked, wanting to put it inside the car with us. “It will be fine. We have done it many times.” Lion reassures me. I take a deep breath and turn back to finish packing my things. There is a distinct iron smell here that pervades everything, sun-baked clay, dust, centuries old struggles pouring out of sweaty skin—life commingled with nature. When I first arrived, I smelled it pungent on people fresh from the bush. I didn’t know how to respond or how to act when someone got close to me. Now it soaks into my clothes and my gear no matter how hard I scrub them in the wash basin. The sun bakes it onto my skin when I bathe. Sometimes I feel it forcing its way through my pores deep into my veins. My blood carries it through my body changing me. Now, I hear myself saying, anchihpol meit apay, as I say goodbye to the girls in the camp and face the Land Cruiser to head back to the compound. Achan tonj makes a basket in the village of Aker adoor. Achan came to the well on its third day in existence. “I came to the well today because I need the water to soften the reeds for my basket. I will sell it with another one tomorrow at the market. I get 25 South Sudanese pounds ($5.00 US dollars) per each basket. “I used to walk two hours to a well in another village for my drinking water. I had to go three or four times a day with my daughter and I could not spend any time making baskets. My husband died seven years ago and so I must do all the work to take care of my children and my compound. Achan soaks the reeds needed for her basket. with a well nearby she will now have time to make and sell baskets, and her daughter can attend school. JUBA, SOUTH SUDAN A few weeks ago I was late for work, so I only had time for an eight-minute shower—just long enough to wash my hair and soap up, no exfoliating or shaving. The average shower head in the United States uses two and a half gallons a minute. My eight-minute “quick” shower squandered about 20 gallons. Because my mind was on my upcoming trip to South Sudan, I was horrified when I stopped to fathom those numbers. The first time I had travelled to South Sudan, the trip leader had emailed us warning that we would have no access to fresh water for days at a time and when we did have a little water for bathing, it would amount to about eight cups in a wash basin behind an old acacia tree. Then the email outlined very specific directions on how to use those eight cups. “Step One,” the email said, “put the shampoo on the top of your head with your hair dry and rub it around until it has evaporated.” The first time I had the chance to do this in the African bush was about four days into my trip. There were five of us in South Sudan to observe the drilling of a well for the non-profit Water for South Sudan. We had spent most of our time underneath a fig tree watching operations, talking to villagers, and sweating. I tried to wash up at the end of each day with wipes, but by the second night, I realized that was useless. Dust and sweat commingled on my skin within minutes of stepping outside my tent each morning. By the fourth night, one of the drilling crew had come back from a day trip to another village that had a well. He brought with him a fresh supply of water. I could finally take my eight cups and my shampoo out behind the fig tree. Ironically, the daily recommended amount of water for consumption is also eight cups. However, that number rises after a workout or in very hot climates, like South Sudan where the average temperature is over 100 degrees. The children in our camp had confiscated our used bottles so they could fill them with parasite infested marsh water. By the end of the first day, there were a number of school aged children in our camp mimicking us Americans by sitting in our chairs, drinking their brown marsh water out of plastic bottles, and giggling to themselves. Shortly after that, I developed a primal imperative to hoard water at all costs. I forced myself not to take large gulps when I was thirsty and instead took small sips at intervals throughout the day. I began stashing water bottles in my tent. Given enough time, I could see myself manically digging holes all around the compound just large enough to store 16 ounce bottles. By the third day, however, my survival mania ended when I felt a little light headed in the midday sun. I drank all of my reserves in less than a few hours. It was a lesson about fear’s irrationality I didn’t need twice. Step two wasn’t as easy as it sounded, “Conserve the first cup of water as you pour it slowly over your head, making sure to palm the falling drops at the top so it pools and mixes with the shampoo. Then begin to work the lather through the ends of your hair.” As I stood there naked in the open, with my little cup of water, I looked at the recently worn path behind our camp that villagers had been using to watch the drilling process. After the well was finished, the path would widen and smooth out as the walking patterns of women and children changed. They would no longer have to spend eight hours a day going back and forth to the marsh for unhealthy water. Instead, children would go to school and mothers could spend more time at home and then they would take their own full basins of water behind an old acacia tree. I thought about all the water I had squandered in the name of vanity, and it made me self-conscious. Had I wasted time exfoliating my face in the shower back home? Did I really have to shave my legs while the water was running? I wondered if anybody on the path would see me as I undressed. I saw myself as if I were the stranger walking the path. I watched as my fingers untied the rubber band that let my hair fall in knots past my shoulders. I felt my identity slipping through my fingers. All that long hair, all that maintenance; it seemed quite ridiculous out there in the open where dust and thorns and heat commingle. Eight cups wouldn’t come close to washing it all. I could only hope to get it wet, clean my scalp, and rinse out some of the dirt. Step three, “Follow the directions from step two with another cup of water but reuse the soapy lather spilling down from your head to wash your body starting with your face and moving downward to your neck and shoulders.” I originally thought the directions were ridiculous, the product of an over zealous team leader. I was a full grown adult. I could have figured out how to bathe myself with only a small basin of water. But, once I was there standing naked in the desert with four days of clay and sweat layered over my skin, I understood why this method was necessary. I wasn’t reaching into a tub again and again with the same dirty wash cloth spilling water all over the ground. Every drop of water was conserved and recycled on my body. I had watched the drilling crew use this same philosophy in their operations. Salva, the founder of Water for South Sudan, had told us that in Africa, everything gets recycled. One day as the drill was about to break dirt, a rubber gasket broke on the mud pump. Without any supplies or stores nearby, the crew had to improvise. So they cut rubber from an old tire to match the gasket and then secured it with the steel from the tire. The mud pump worked and within a few days the well was complete. Old burlap bags got torn apart for sewing string. Old bladders used to carry water were cut up and used for patches. Everything was repurposed; even our empty water bottles weren’t wasted. The final step, Step four, was a meditation in acceptance, “Continue to pour cups of water on your head. Keep lathering and soaping the bottom half of your body while simultaneously rinsing the top half until your body is clean.” In theory, this sounds like a great idea. Or maybe it works for people with no hair. I just became a muddy mess as brown suds dripped down my legs and dried. There wasn’t enough water to rinse the soap off of my hair let alone my body. I had anticipated this eight-cup bath for so long, but when I finally got it, all I wanted was a shower—a full freezing cold pouring gallons kind of shower that, by its sheer force would rinse the dirt away from all of my various cracks and pores. Or maybe that wasn’t enough. Maybe I also wanted to float in a pool of clean blue water surrounded by Italian tiles of vermillion while drinking an endless supply of iced lemonade. I never got to the pool, but in the end, I did get to see that beautiful moment when the drill finally reaches the aquifer, which in South Sudan is about 175 feet down. Back home fresh from my shower, I thought about the day the drill had reached the aquifer. There's that moment when everyone is anticipating the geyser of clean fresh water that would explode out of the ground in great life changing force. I thought about how hot and thirsty and dusty I was, I considered the amount of restraint it takes to not turn a drop into a gallon, and I realized that the directions were less of an imperative than they were a meditation in consciousness—a thought I will keep with me as I head back to South Sudan, this time to evaluate wells drilled ten years ago. WFSS board member Angelique Stevens in snowy Rochester, NY, ready to leave for South Sudan. Water for South Sudan board member Angelique Stevens traveled to South Sudan on January 15 to begin our first formal evaluation of wells. She will spend some time in Juba with Salva Dut, WFSS Executive Director for East Africa Operations, and then head to our Operations Center in Wau for final preparations for the trip into the field which will start about Feb. 1. "Water for South Sudan is so grateful to Angelique and the team who prepared for this well evaluation process," says WFSS vice president Bob Shea. "The information gathered on this trip will be extremely valuable to the organization in so many ways. We will learn about the functioning of our wells, and the entire process will be able to be repeated in the future." Stay tuned here for news and updates from Angelique as she travels with Ater "Lion" Thiep, our Field Operations Manager, to visit some of the earliest wells drilled by WFSS and survey villagers on functioning of wells.